” ‘Can I ask a question?’ said Richard. Richard is a decent guy, a mild-mannered fellow with an undistinguished office job. His life is on track: he is engaged to a beautiful (if somewhat intimidating) woman, enjoys time with his friends, and generally doesn’t make waves. However, it all changes when he stumbles on the bleeding body of a young woman one night and knows that the only decent thing to do is to stop and help her. When Richard stops to assist the girl, his whole world shifts and he is tumbled into the underworld of London. This isn’t just the sewer-underground-metro London, though; it’s a whole new plane of existence. This strange and threatening tunnel-world is populated with frightening beasts, tricksters, a thriving market economy, and a host of memorable characters, including a huntress who specializes only in the biggest and most dangerous animals, a marquis who barters in favors, and an angel. Richard has no choice but to go forwards, deep into the underbelly of London. After he stops to help the injured girl, no one in his former life even recognizes him anymore. The only way out is in, and so, Richard embarks on a quest leading him through the depths of the underworld, facing a maze of filthy tunnels, nightmarish dark, and chilling characters. If I had to classify this book, I would say it’s is a dark urban fantasy. It’s not inaccessible, like sometimes true fantasies can be, though. Richard is just an ordinary, somewhat bewildered nice guy, and so you learn about this new, Dark London along the way, just like he does in the story. It’s an intricate plot, but easy enough to follow, and very interesting. I love the dark, gritty feel of the underworld, especially as observed by Richard, who is quite pitiable. He actually reminds me of Arthur Dent in Douglas Adams’ The Hitchhiker’s Guide to the Galaxy, one of my favorite books. It’s a similar idea: a nice, ordinary guy gets sucked into an unbelievable adventure and has to cope with all the accompanying unpleasantries. Come to think of it, that actually encapsulates the plots of a great number of books out there, from The Odyssey to Alice in Wonderland. And speaking of Alice, there are a number of references to the Lewis Carroll story tucked away in this book, which I thought was a fun surprise. 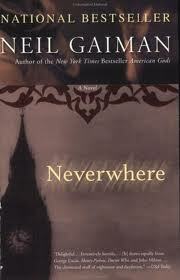 Gaiman, Neil. 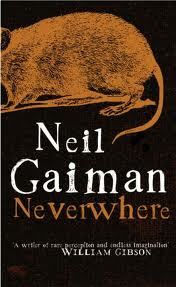 Neverwhere. Harpertorch, New York: 1996. 370 pp. Ages 15 and up. If you liked this book, you might want to try John Connolly’s The Book of Lost Things or The Gates. They’re both dark fantasies that still have strong connections to reality, so they are very accessible, even to the non-fantasy-reader. However, they are really for the 16 and up crowd. If you’re a little younger than that, you might try The Hitchhiker’s Guide to the Galaxy by Douglas Adams, or The House Eaters by Aaron Polson. Posted on April 5, 2011 by ShannaPosted in Adventure, Fantasy, HorrorTagged London, magic, rats, science fiction, urban.